It seemed like a perfectly ordinary Tuesday in Sylacauga, Alabama, on 30 November 1954. Ann Hodges, a 31-year-old housewife, was comfortably stretched out on the couch in her home, taking a mid-afternoon nap. Suddenly there was a sharp explosion in the sky, a bright flash, and a large, mushrooming cloud. People were startled as far away as Georgia and Mississippi. It is safe to say, however, that no one was more startled than the sleeping Mrs. Hodges – for suddenly, with a deafening crash, a nine-pound meteorite smashed through her roof, bounced off the wooden radio at the foot of her couch, and rammed into her. She received severe bruising on her hip and arm and had to be hospitalized, both for the pain and because of slight shock. The story became big news all around the world, as this is the only documented instance of a person being injured by an extraterrestrial object. The Air Force confiscated the meteorite for study, but the Hodges began a legal fight to recover it because they received numerous offers from museums and universities, one reportedly as high as $5,000. It took a year for the Hodges to get their valuable meteorite back – but by then interest had waned, and Mrs. Hodges ended up donating it to the Alabama Museum of Natural History. The following newspaper articles give an indication of the strong press interest in this matter. Some writers took a serious approach to this topic – but several, as you will see, made fun of the incident. SYLACAUGA, Ala. (UP). – A star fell on Alabama Tuesday. An object from the sky, apparently a meteorite, crashed into a house here. At about the same time, a thunderous explosion, followed by a white mushrooming cloud, was reported from many places in three southern states. The Air Force, Alabama Highway Patrol and local police began an investigation of the phenomenon. Dobbins Air Force Base at Marietta, Ga., reported that a “meteor” had fallen 40 miles south of Birmingham. Sylacauga is about that distance southeast of Birmingham. SYLACAUGA, Ala. (AP) – A meteorite crashed through the roof of a house Tuesday and slightly injured Mrs. Hewlett Hodges, 31. George Swindle, field representative of the U.S. Geological Survey, tested the nine-pound object and identified it as a sulphide meteorite. A mysterious explosion in the Sylacauga area, about 55 miles southeast of Birmingham, set off a three-state search in which 35 or 40 planes took part. But there were no planes reported missing. The explosion was seen as far south as Phenix City, on the Alabama-Georgia border. Dr. Walter B. Jones, Alabama state geologist, said evidently a meteor exploded in southeast Alabama, and Mrs. Hodges was hurt by a particle of it. 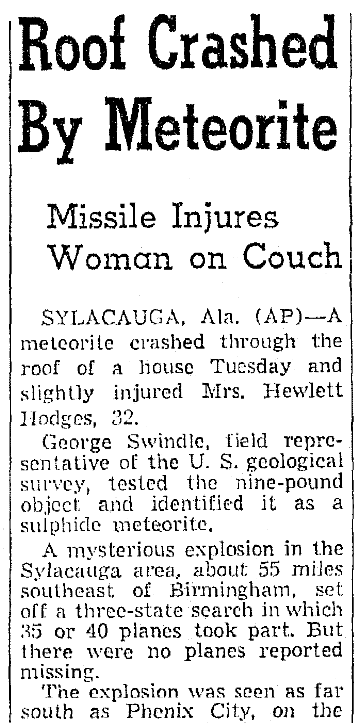 Mrs. Hodges said she was lying on a couch in the living room of the frame house when the meteorite smashed a three-foot-wide hole in the roof and tumbled through the ceiling. “It hit our radio at one end of the couch and bounced off on me. It hit me on the arm and hip,” she said. Police summoned a doctor when they arrived and Mrs. Hodges was treated for bruises. SYLACAUGA, Ala., Dec. 4. – (AP) – At least 75 bids for a meteorite which struck an Alabama housewife have been received by the woman’s husband, with the mails still bringing additional offers. 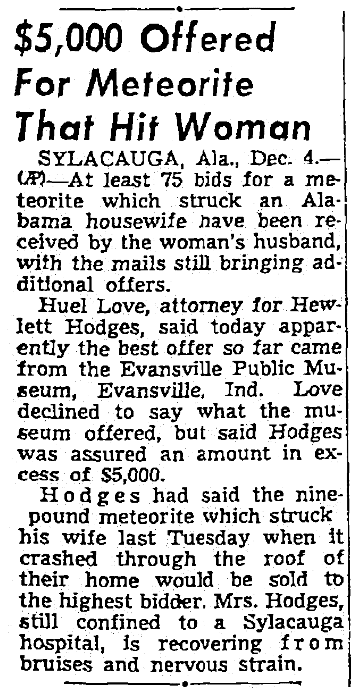 Huel Love, attorney for Hewlett Hodges, said today apparently the best offer so far came from the Evansville Public Museum, Evansville, Ind. Love declined to say what the museum offered, but said Hodges was assured an amount in excess of $5,000. Hodges had said the nine-pound meteorite which struck his wife last Tuesday when it crashed through the roof of their home would be sold to the highest bidder. Mrs. Hodges, still confined to a Sylacauga hospital, is recovering from bruises and nervous strain. 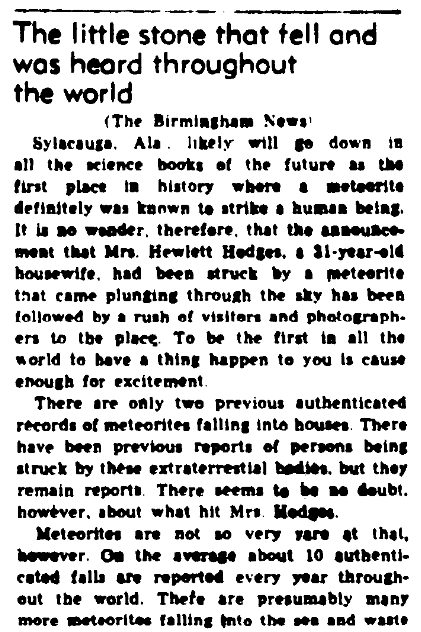 Sylacauga, Ala., likely will go down in all the science books of the future as the first place in history where a meteorite definitely was known to strike a human being. It is no wonder, therefore, that the announcement that Mrs. Hewlett Hodges, a 31-year-old housewife, had been struck by a meteorite that came plunging through the sky has been followed by a rush of visitors and photographers to the place. To be the first in all the world to have a thing happen to you is cause enough for excitement. There are only two previous authenticated records of meteorites falling into houses. There have been previous reports of persons being struck by these extraterrestrial bodies, but they remain reports. There seems to be no doubt, however, about what hit Mrs. Hodges. Meteorites are not so very rare at that, however. On the average about 10 authenticated falls are reported every year throughout the world. There are presumably many more meteorites falling into the sea and waste places where no one ever sees them. There have been close shaves before. One of the meteorites that fell through a roof scattered debris upon sleeping children. About 20 years ago a meteorite plunged through the motor of an automobile traveling along a highway in, we recall, Illinois. Still fewer years ago, a farmer in Limestone County, Alabama, saw one plunge into the field where he was working. Perhaps mankind has been relatively fortunate in escaping injury from these missiles from space. Or perhaps we need to remember that all the human beings of the world after all occupy but an infinitesimally small part of its surface. Hasn’t someone estimated that all the human beings now existent in the world could be put into a box a half-mile square that could be dropped into the Grand Canyon of Arizona without the box reaching the top? The meteor that crashed through the roof of the Hodges’ home in Sylacauga was relatively small. It was about seven inches in diameter and weighed nine pounds. But a few huge meteorites have been recorded. Some weigh hundreds of tons. And the earth’s surface is pocked by fall of meteorites in prehistoric times. There is Meteor Crater in Arizona a half-mile in diameter. A still larger water-filled hole in Canada is attributed to a meteorite’s fall. Along the shores of North Carolina, aerial photography has revealed a peculiar arrangement of bays which astronomers believe may have been caused by a cluster of meteorites, such as one may find in the head of a comet. About the turn of the century, a great meteorite fell in an isolated region of Siberia, destroying the forests for miles around. What if some of these mammoth meteorites had fallen upon a large city, such as New York? We have no assurance that such a catastrophe will not come. We are protected only by the laws of nature and chance. But if all the areas of the cities of the United States were combined they would equal less than one per cent of the country’s total surface. AMERICA remains a land of opportunity, where every man has a chance to strike it rich. Down in Sylacauga, Ala., a nine-pound meteorite crashed through the roof of a man’s house, bruised his wife and brought him scores of bids, up to $5,000, for the rock. Here, now, is hope for everybody. The big gold rushes seem to be over, and bringing in an oil well has become a matter of large companies exploring and drilling scientifically. Finding uranium entails a certain nuisance, tromping around over difficult terrain and all that. But being struck rich by a meteorite – that could happen to any one of us, wherever we live. There’s no trouble about it and no planning is necessary. It could come like a bolt from the blue. That is, if we still can leap up. Sometimes, when it happens so unexpectedly, riches go to a man’s head. 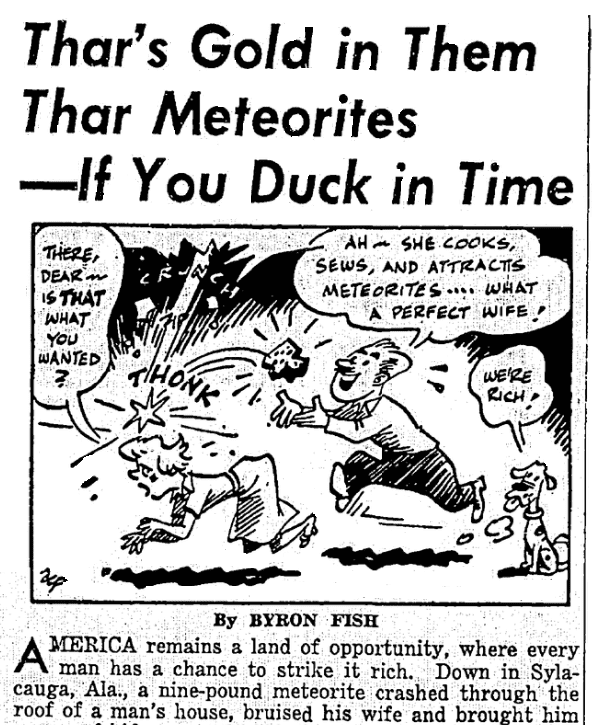 Judging by this first meteorite strike, the prospector’s equivalent of a Geiger counter is a wife. That adds a nice domestic touch to the business, which gold, oil and uranium prospecting have lacked. Gold strikes, particularly, have been roughneck affairs. If the Forty-niners had had their wives along, there wouldn’t have been all that fighting. There might have been some hair-pullings, but not the shootings. One might argue that meteorite stories therefore won’t produce the drama that has gone with gold. While it’s true that comfortably waiting for a meteorite is a pretty passive pursuit, there’s still a story potential that should appeal to Hollywood. We can see a psychological plot involving a couple who have been married for several years, and whose domestic life has become reasonably routine. The wife is startled but pleased at the romantic notion. They go out and look at the night sky, and the husband begins talking about the stars and her. He seems very anxious to see a shooting star. “I want to wish on it,” he says. They keep going for evening walks. The wife thinks it’s a second honeymoon phase, until one day she finds, in her husband’s desk, the clipping from Sylacauga, Ala.
There’s the emotional punch. Does her husband love her for herself alone, or for the money that might “fall air” to her? In just what way does he think she’s attractive. Then comes the smashing climax. Both men are struck by a 37-ton meteorite worth $41,400,000, which gives the movie a happy ending.